ArtHistory.viz explores the applications of cultural analytics to art history. Lev Manovich / November 2008. Testing cultural analytics approach using a sample data set of 35 canonical art history images - from Courbet (1849) to Malevich (1914). 1) automatically measure images to extract various statistics and features. 2) make graphs: points represents images, Y = time, X = values on one or more dimensions.  In this sample graph, we plot reverse skew value for each painting vs. the year the painting was made. Art history and other cultural disciplines conceptualize history of culture in terms of small sets of categories: movements, national schools, historical periods, -isms, etc. Graphs: superimposing standard art historical categories on the data. But why force contiuous cultural developments and dynamics into small sets of categorical boxes? 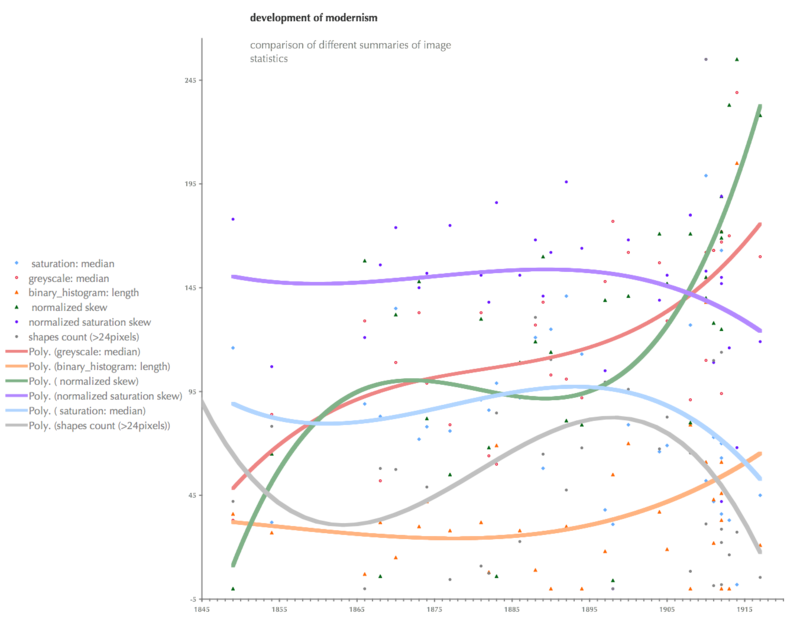 Using numbers to represent cultural atifacts allows us to visualize cultural developments as continuos curves. 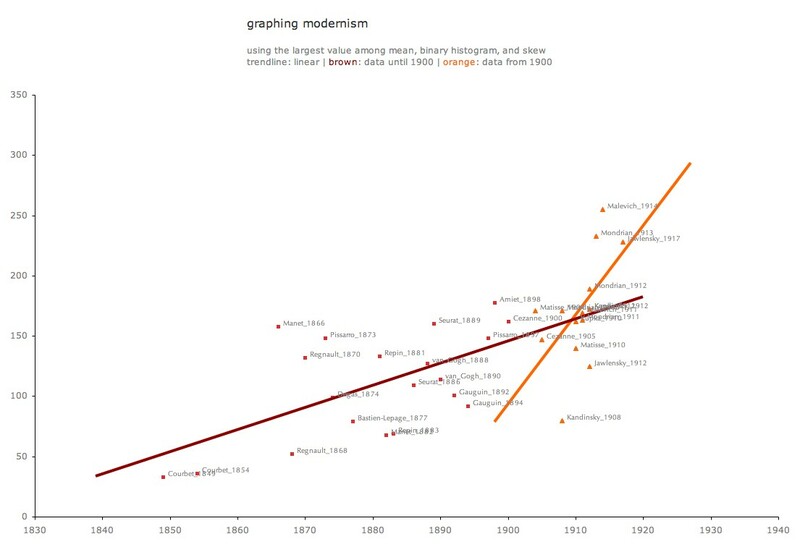 Graph: the movement from 19th century realism to early 20th century modernism. We can compare the patterns in different cultural data sets both visually and quantitatively. 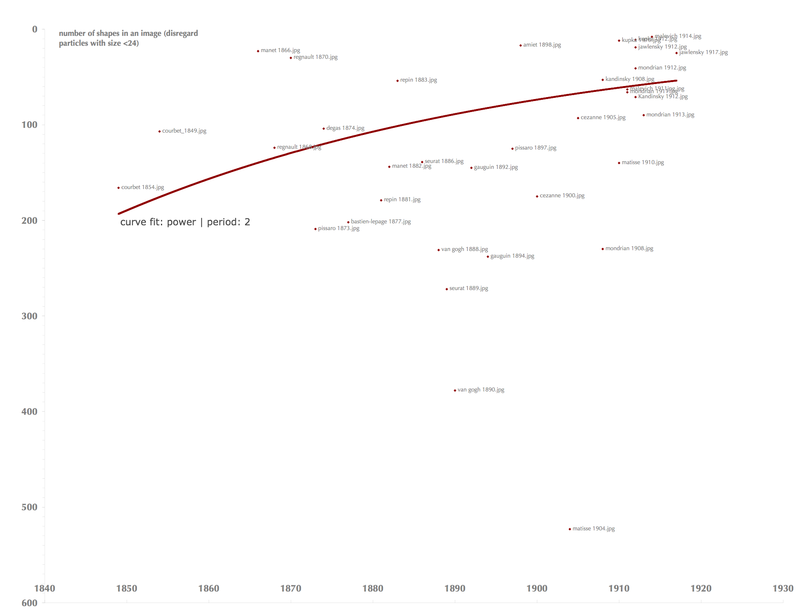 Graph: comparing the changes in paintings before 1900 vs. the paintings after 1900 using linear trendlines. We may find the differences between cultural sets which at first sight appear to be identical. We may find the similarities between the sets which are thought to be very different. 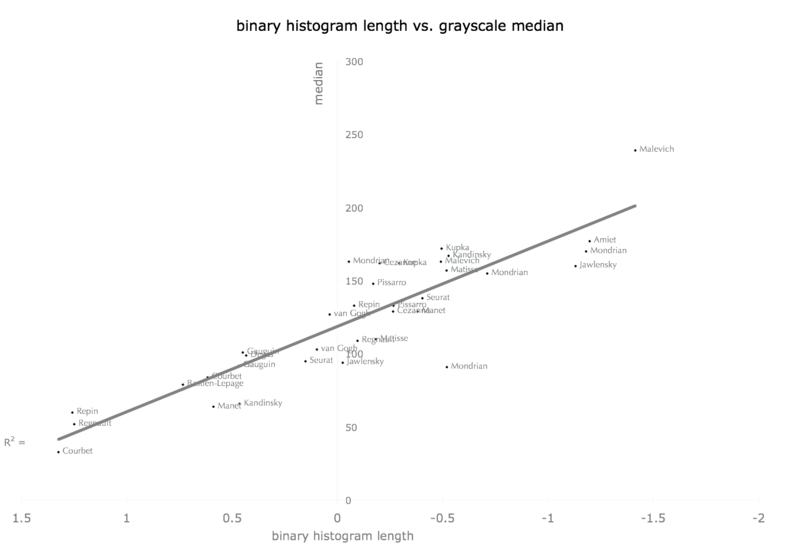 Graph: comparing the change in median values of "realist" paintings vs. "modernist" paintings. Images can be analyzed on hundreds of different visual dimensions. It is important to keep in mind that depending on the dimensions we chose to analyze, the resulting pictures of cultural patterns will be also different. Graph: comparison of 6 different summaries of image statistics. We can use standard statistical techniques to discover cultural patterns - or to confirm the patterns we may see if we visualize the data. Graph: correlation between the changes in binary histogram length and median values. Visualizing cultural data can reveal the relative statistical dispersion of different cultural data sets in relation to each other. 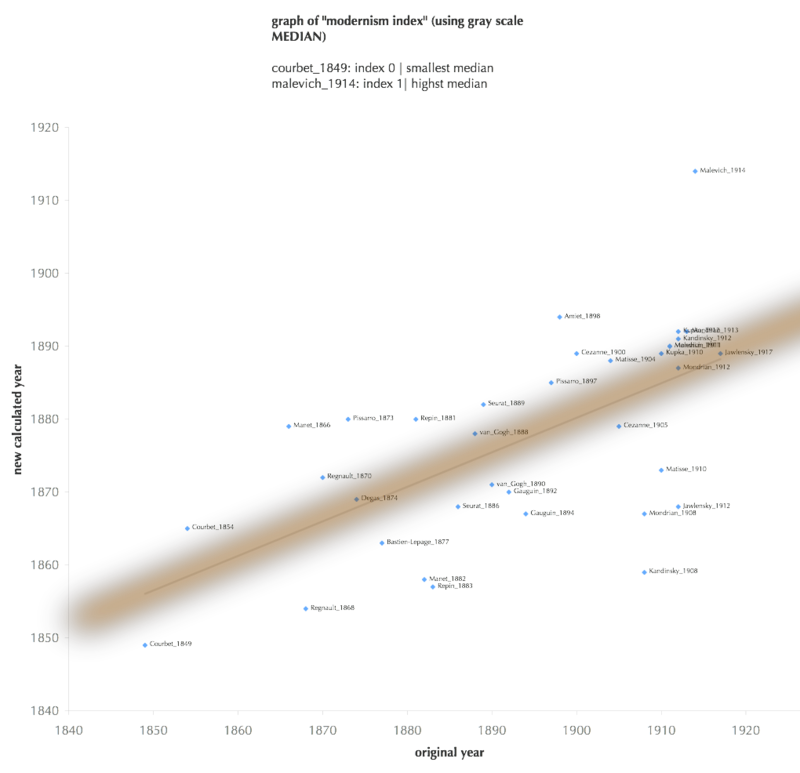 Graph: comparing dispersion in two data sets (post-impressionism and 1910-1915 abstraction). Quantitative automatic analysis can potentially allow us to develop quantitative measures for "cultural innovation," "cultural openess" (openness to adopting elements from other cultures), "the speed of cultural change," and other cultural dimensions. The following is a very early experiment (not to be taken too seriously. Which artists were "ahead of their time"? 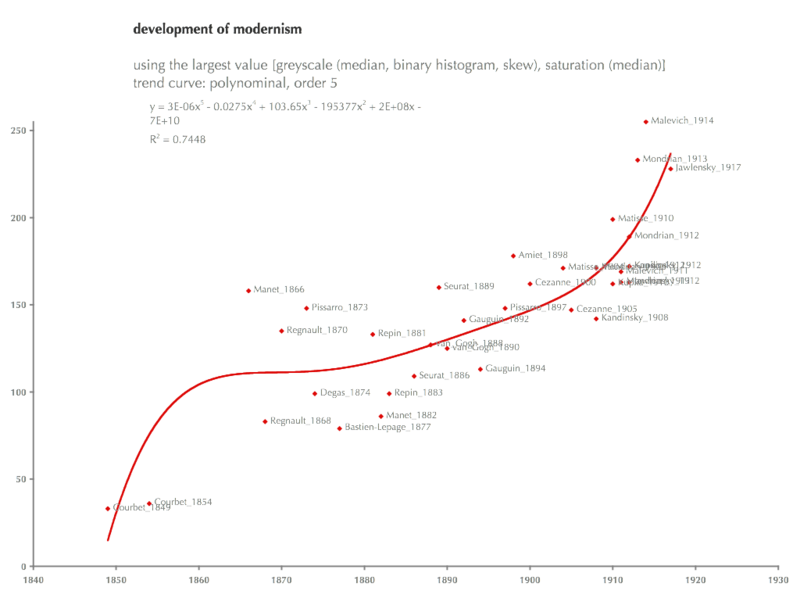 Graph: a diagonal line shows the general tendency in the movement from realism to modernism from 1849 to 1914. The paintings which are above the trend line are "ahead" of the general trend. Multiple graphs can be combined to study the individual artifacts within the context of larger data sets. 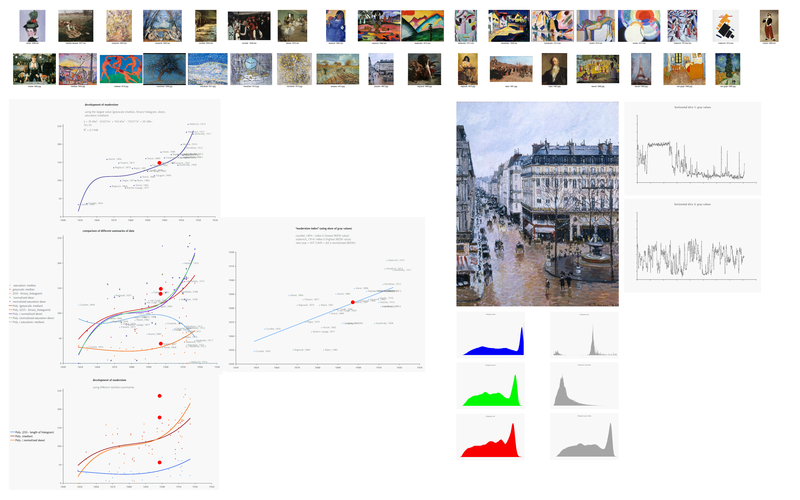 Graph: top: the image set; right: a single image and its analysis ( Pissaro, 1898); left: the graphs which show the data for the whole image set, with the Pissaro's painting indicated in red.